I happened upon this quote this morning after I had again scraped the ice from my truck windows and wondered about the arrival of spring weather. The cold frame has its heating cable plugged in and I moved the stock Geraniums and Onions out there yesterday because there is no room left under the lights in the basement. I was the gardening expert, answering questions at a city sponsored sustainability day. That was a long day but it had some great results. I helped many people with gardening problems and I convinced several of them to try their hand at vegetable gardening. I spend the day sowing all of my Pepper, Eggplant and Tomato seeds. The activity draws people’s attention and then I tell them that I am planting my vegetable garden. Bringing all of those seed starting trays home is what instantly created the need for more space. At the back of the cold frame I have put a couple of my recent mistakes to see if recovery is possible. At our Garden Writer’s meeting we were given a Sheridan Nurseries 100th anniversary Rose. They had been growing in a green house and even had small flower buds. We came home late and tired after that meeting and I left them on the front porch. I have cut back the canes to about 15 cm to get rid of all the frozen leaves and hopefully the frozen tips of the canes. I eagerly await the appearance of new shoots, indicating that I didn’t completely kill these lovely plants. Spring is happening in the kitchen. Pots of miniature daffodils are moving from the cold room to the kitchen and brightening up the cold spring days with their cheery yellow blooms. That bit of work, planting them in the fall, is paying big dividends during these cold spring days. When they have finished flowering those pots of bulbs will be watered and fertilized and kept from freezing until the bulbs have matured. The bulbs will be saved and planted somewhere outside in the fall so that they can continue to provide us with spring blooms for many years. Forced bulbs do not generally force well a second time but they will rebuild themselves and bloom in the garden, although that may take a year. 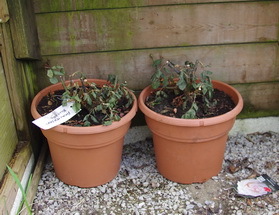 All of the seeded Begonia boliviensis have now been transplanted into 4" pots and that is one of the reasons that space is being squeezed. The few Tuberous Begonias that I saved from last fall are now being started so that they will be big, blooming plants when they go outside in the late spring. Many of my Tuberous Begonias did not make a big enough tuber to save last year. They were constantly attacked by the powdery mildew fungus and despite my efforts to beat it back with some sulphur dust, their growth was greatly reduced and as a a result they did not make much of a tuber. This is not always a bad thing as I was able to wander onto Garden Import’s web site and buy some nice new tubers with new varieties that I couldn’t live without. These tubers will all be planted rather close together in a big shallow container. 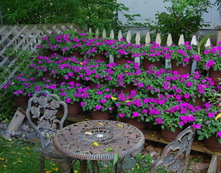 Their concave tops will be just at the soil level so that they do not get filled with water when this pot is watered. When they have grown a few nice leaves and it is looking crowded they will get separated into their individual containers. 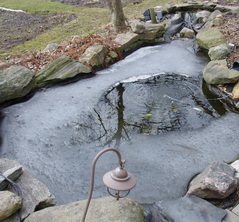 As the weather has fluctuated, my ponds have lost some of their ice and then frozen again a few times. The middle pond has never opened up until this last few days and I noticed a few strange things. There are several dead fish obvious through the hole in the ice but all of the fish in the other ponds are happily, but slowly, swimming around. The bubbler in that pond seems to be putting out much less air than the other two are and that’s why the ice didn’t leave as readily. Is that also why the fish are dead? My rationale for running those bubblers was to inject air into the ponds to enhance fish survival and apparently they are doing that. I’ll probably have to buy a new bubbler for that pond next fall. It’s alway nice to have your theories confirmed but this was not a particularly great way to do it. I can’t see any other reason why only the fish in the middle pond have failed to survive the winter as they have on all previous years. It’s off to the aquarium store to buy a bunch of 32 cent feeder fish to restock that pond. Along the pathway at the side of the house, under the shade of the huge Black Walnut tree, I have a three level stand that supports about 30 - 25cm containers. For the last several years they have held a great show of Impatiens. Those Impatiens, in the deep shade, were the first to collapse with the Downy Mildew last summer. We know that this fungus disease produces two kinds of spores. One is airborne that spreads the disease from plant to plant and the other is soil borne and lays in wait in the soil for two years for some unsuspecting Imaptiens to show up. Many growers will be greatly reducing or eliminating Impatiens from their inventory this year. I still have this lovely collection of containers and I don’t want to buy all new soil for them even if I was silly enough to try Impatiens there again. They were originally used for a daughter’s wedding and they really did brighten up a dark corner. There are some lovely Fibrous Begonias that might work well there but they are a bit slower growing. 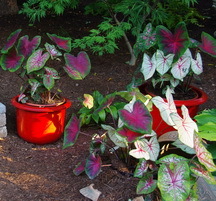 I’m looking at starting some Caladiums. These tropical members of the Araceae family have large brightly coloured leaves and they thrive in the shade. They grow from small tubers that must be overwintered inside unless you live in the deep south. Look for them on the garden centre’s racks with the Tuberous Begonias and Dahlias. I’ll start them a few weeks early indoors, using up even more of my limited space. They have rather inconspicious, but interesting, flowers and are primarily grown for those colourful leaves. Don’t let those leaves make you feel hungry because all parts of the plant are poisonous. Tillie Asks? I planted hardy geranium seeds, cranesbill, that said on the pkg it likes 45 to 55 degrees temp. It also used a word the I can't remember, suggestive of the fact that germination happens over a long period of time and is sporadic. I recently moved it from a cool area about 60 degrees with some light, where one seed germinated within several days, to an area about 55, in my basement cold storage that is dark. Two weeks later, still no action. Seeds were planted end January. I have plastic loosely on top, keep soil moist but not soggy. I am wondering, should I put them outside? I assume if they needed cold treatment, this would have been stated on pkg? Ken Answers I have never tried these myself but my research suggests that many people winter plant them. That is sow in the fall and they will germinate in the spring. 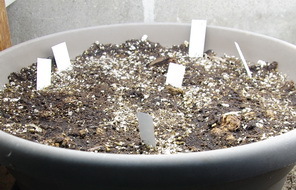 Everyone agrees that germination can take a very long time and is quite erratic. Keeping them cool and being patient seems to be the best advice. Carol Asks ? 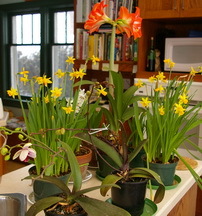 The Paperwhites I received for Christmas have come and gone (naturally). What should I be doing with them other than ignoring them? Ken Answers ! Theoretically you should be able to keep them growing until they regenerate the bulb, then give them a rest and rebloom them. Never tried it because it is rarely successful. They are not hardy in Northern zones so planting them outside is a waste of time. What you really have is a nice pot of material ready for the compost. Mandy Asks ? I would love to pickle onions but find that shallots are so expensive to buy and can only find shallot seeds on the web in English sites. Are us English the only ones who love pickled onions a lump of cheese and a pint????? Ken Answers ! Bought my shallot seeds from Vesey's .